first post in a while, college has been keeping me busy. but tis the season for a little moonlighting. having made a couple of sample models from free patterns on the internet i decided to try my hand at pop-up card designer pro and this is my first completed model. a card for my dad, of his house. a real labour of love, this took many hours designing and prototyping. the right angled roofing sections were an utter pain to fold in the thick paper/cardstock i'd used for my samples. 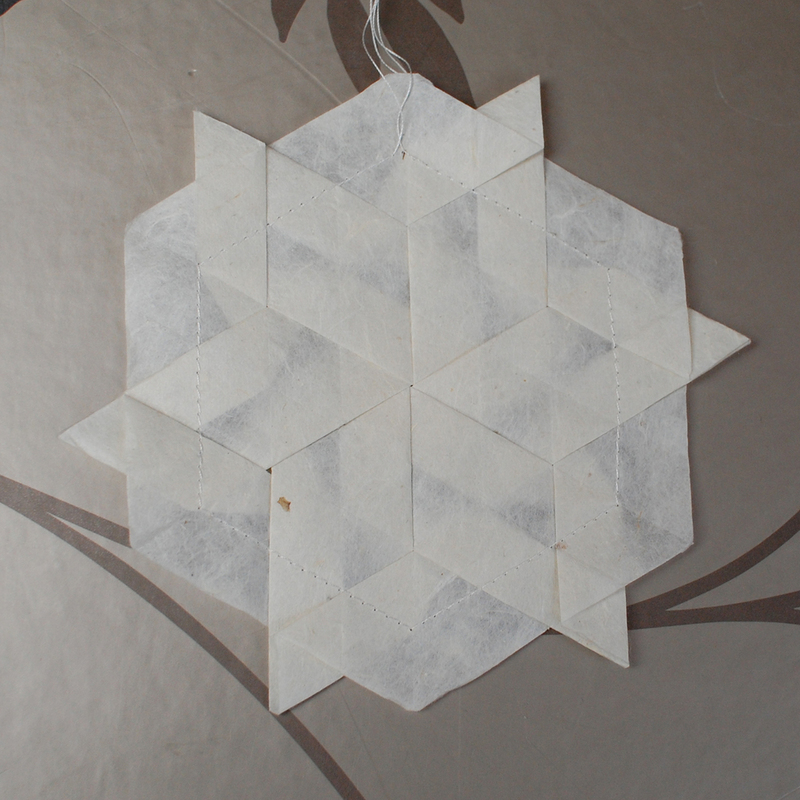 in the end i resorted to the elephant hide paper i used for my pleated tessellations. fairly heavyweight by origami standards this paper has the benefit of withstanding repeated creasing without tearing. in the case of this model sharp creasing is more important than paper weight to keep everything straight and aligned. 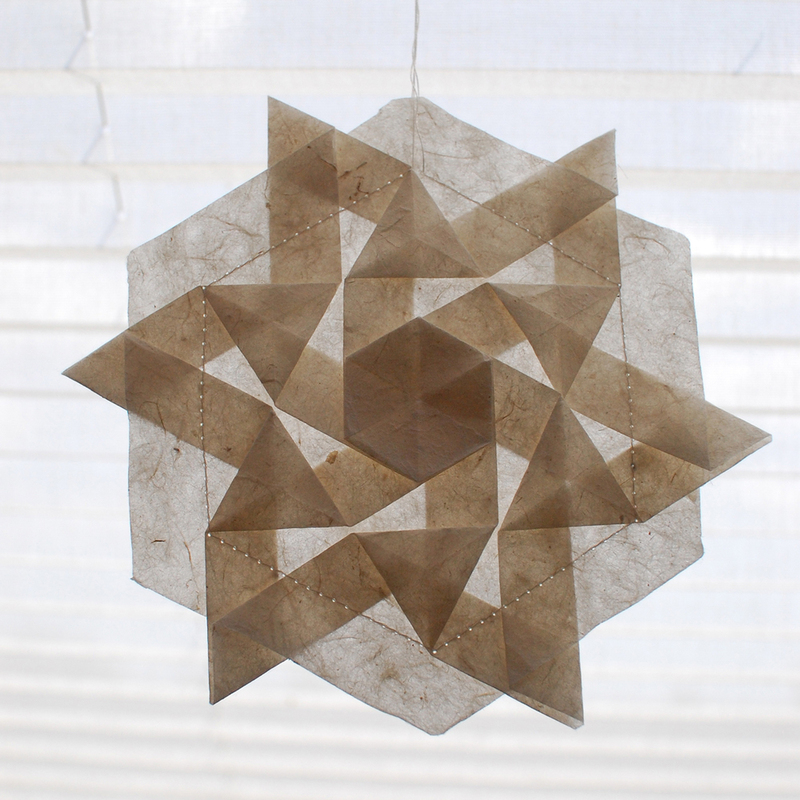 for anyone interested in the technique popupology has plenty in the way of inspiration, free patterns to download and fold yourself, along with detailed videos of the delicate folding process. when i first came across the work of goran konjevod i was instantly hooked. i love that such a simple technique of repeated straight pleating produces such deliciously organic forms. 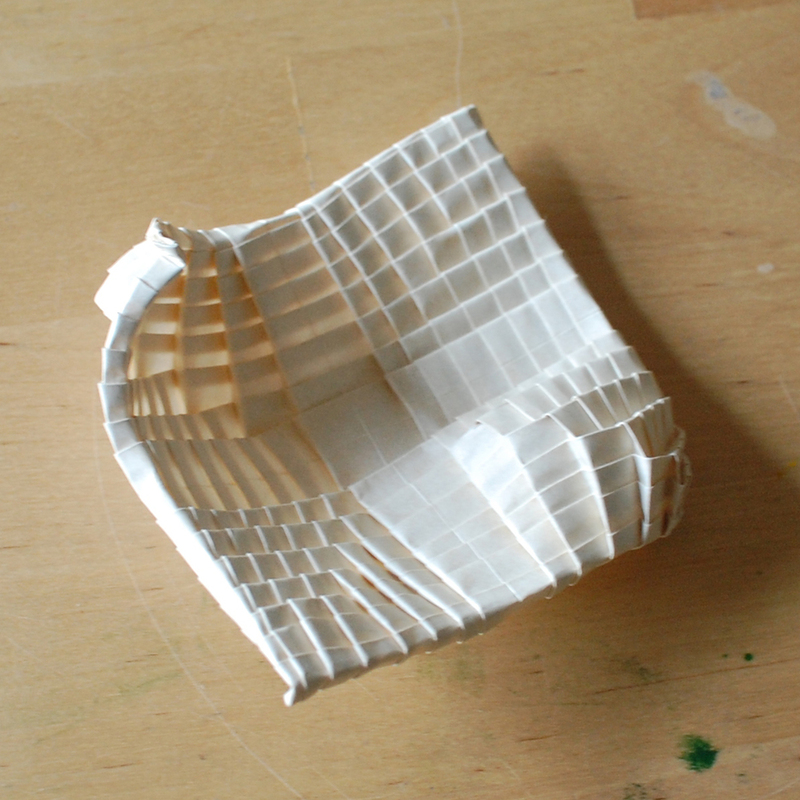 following the stop motion videos on goran's site gave me the basic idea of a square grid and repeated pleats running the full length/breadth of the paper. but frustratingly i couldn't find any detailed information on the technique or folding patterns, and my first attempts were close, but clearly not right. then i stumbled upon a diagram in robin scholz's flickr stream and i was away. in his TED talk goran mentions that it took him ten years between folding his first basic leaf and discovering that there was an additional fold he hadn't realised was required. this locking fold along the edge stops the pleats from fanning out and creates a much tighter, more curved shape. 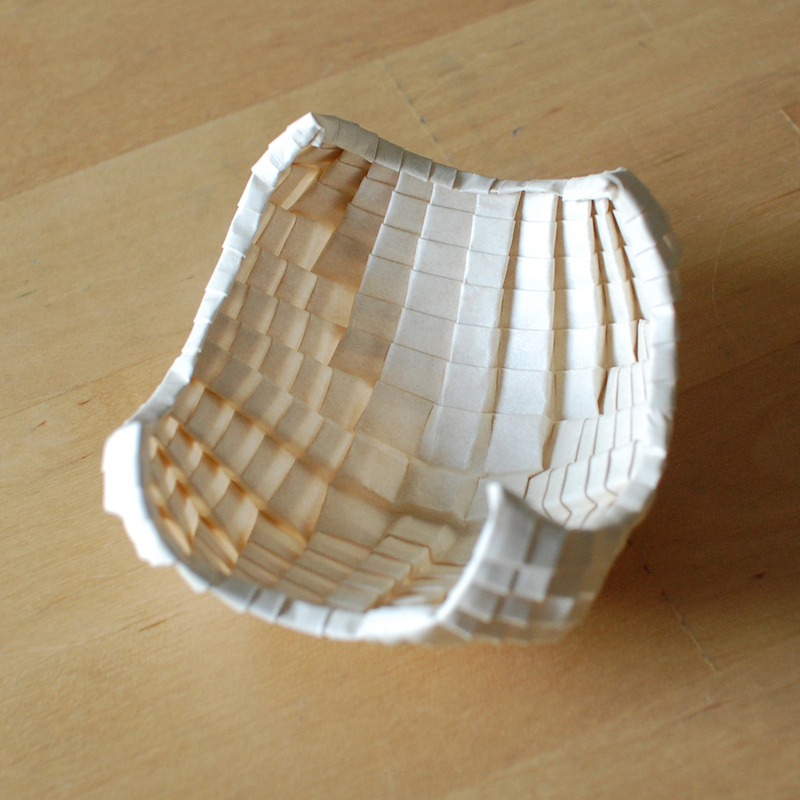 the bowl above is made by pleating the basic pattern from two diagonally opposite corners and then locking the edges. pleats are folded from opposite sides of the paper. fortunately i didn't have to wait so long to find out the secret of the locking fold. 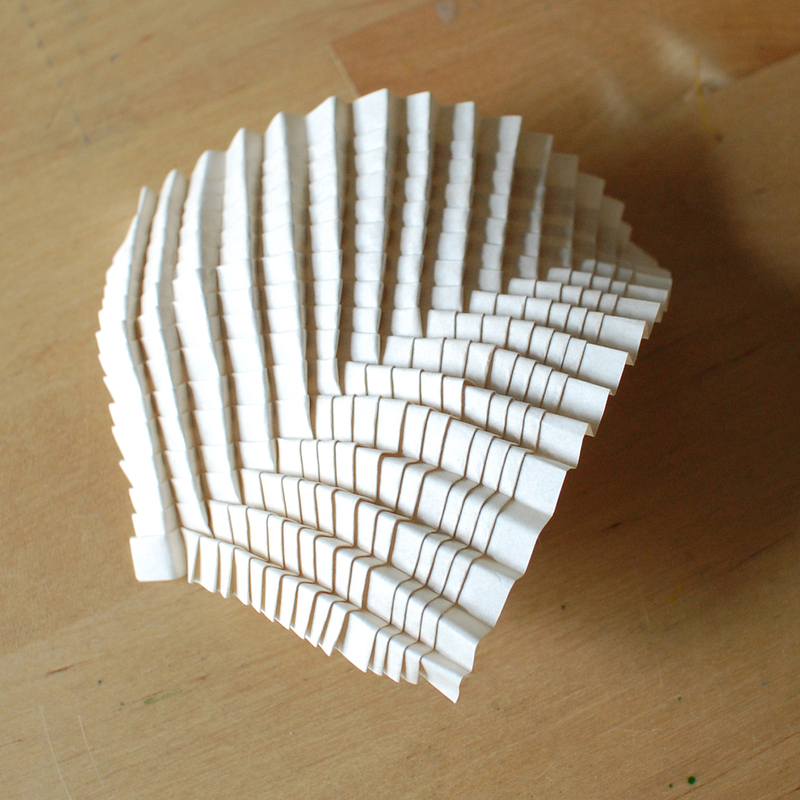 this style of origami is also known as pureland (because it uses nothing but valley and mountain folds, none of the complex twists, pleats or sinks required in origami tessellations) and with that search term i finally turned up a paper (pdf) that explains the basic structures. now i have them down i'm looking forward to more experimentation. eric gjerde's inspirational book manages to make them achievable in a step-wise fashion, given enough patience and attention to detail. 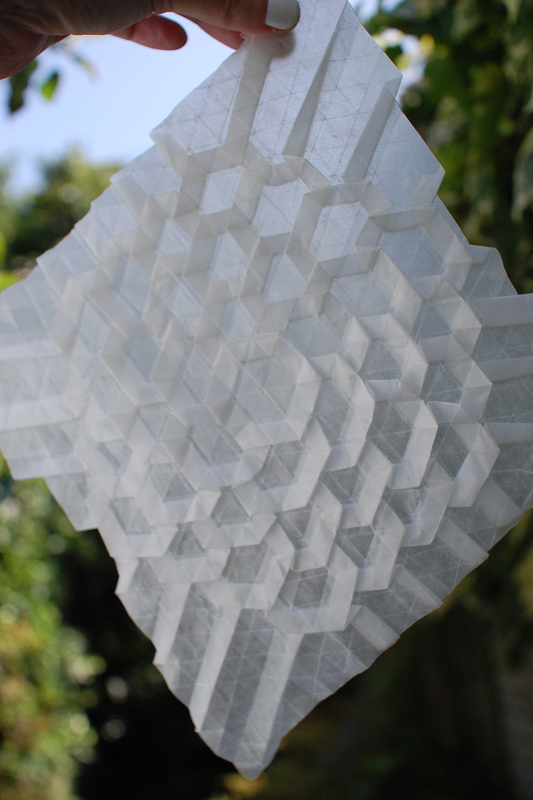 each piece is made from a single sheet of paper, folded into a regular grid (either square or triangular) along which various folds and twists are worked to create the intricate patterns. patience really is the key, when you have to fold a grid of 3,200 tiny triangles you know know you're in it for the long haul :D the grid stage is a meditative process and accuracy then lays the foundation of a happy outcome. 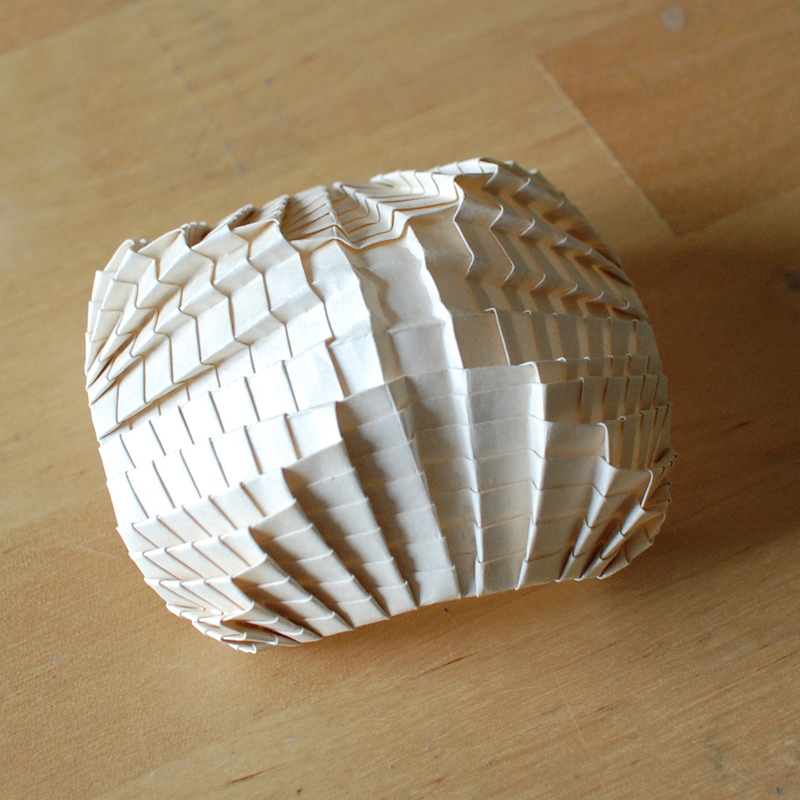 i view it much like warping a loom - as half the work, rather than a necessary evil before the real work can begin. using translucent papers shows off the beauty of the technique to it's full effect. the above piece was made from glassine and turned into a postcard by mounting onto clear plastic with a final layer of glassine for writing/addressing purposes. the above piece is just the central section of eric gjerde's 3.6.3.6 pattern (i'm still lost when it comes to the numbering system). using a soft handmade paper was tricky as the techniques are best suited to something crisper, but i think the result was worth it. 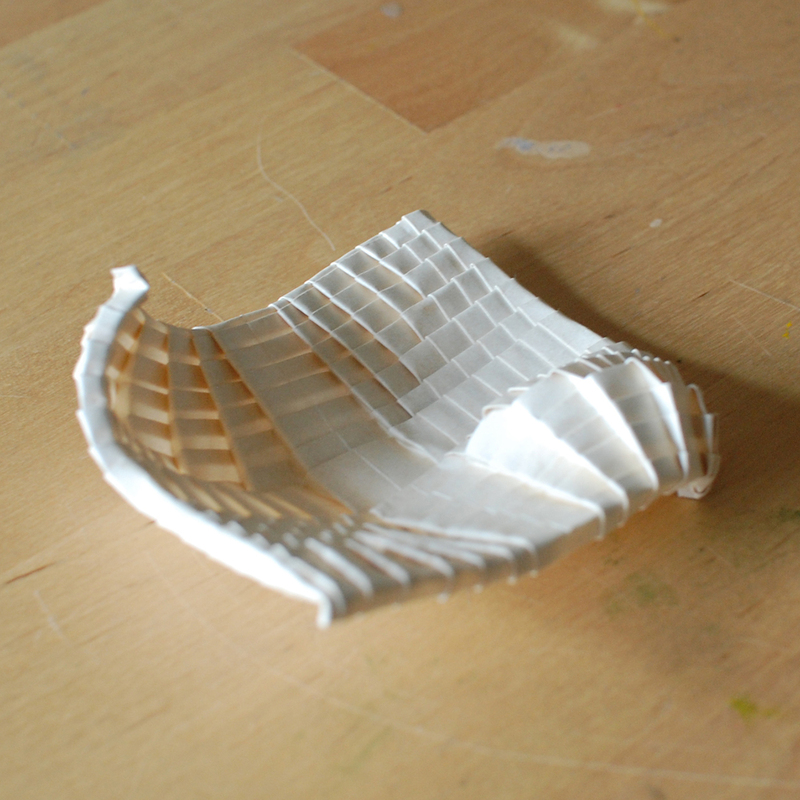 the finished pieces tend to need some kind of stabilisation. to keep the soft, light quality of this piece i stitched around the perimeter. i like that it lets you see the back, which, with its woven quality is just as magical to me as the front.